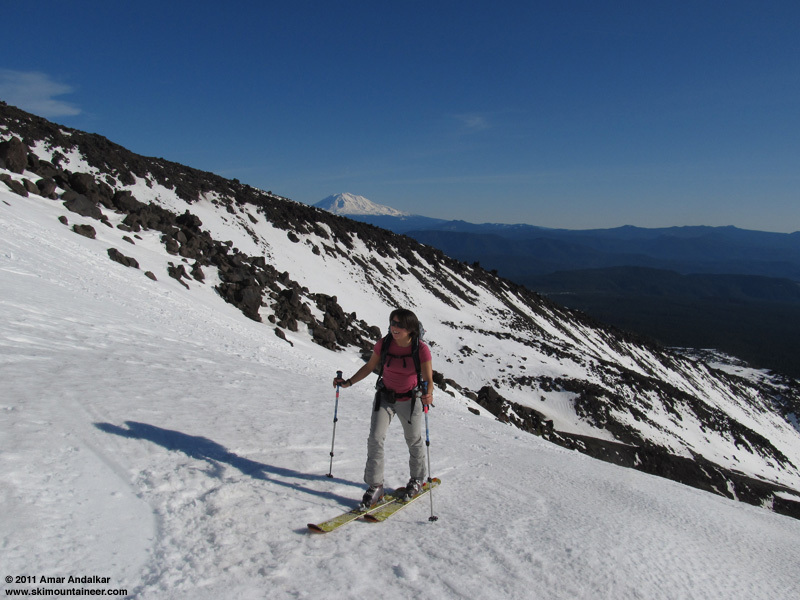 The Worm Flows route is skinnable right now from the car to the crater rim, and skiable all the way back too (with caution on the trail). Smooth windpack on the uppermost slopes, with sunny aspects corned up nicely as expected given the 10000 ft freezing level for some very good turns, while less sunny aspects remained frozen as expected for December. 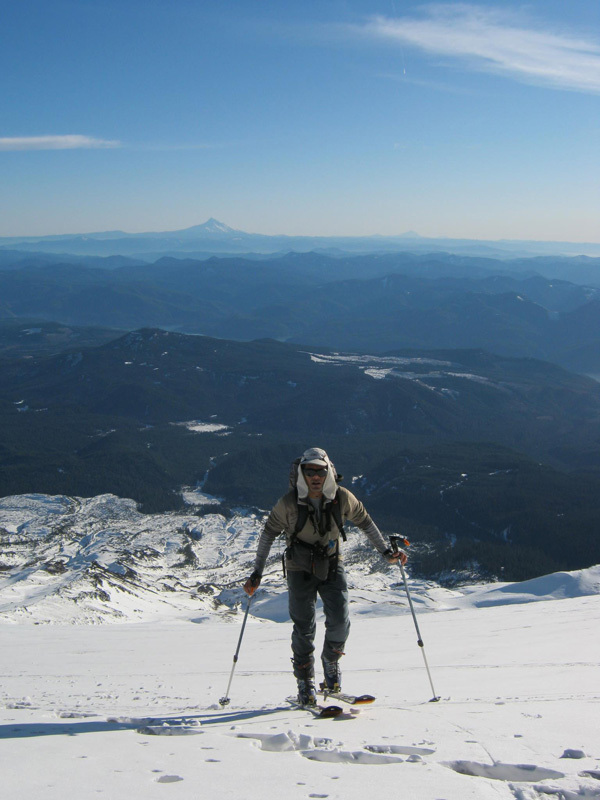 An outstanding day with near-perfect weather and pretty good skiing. 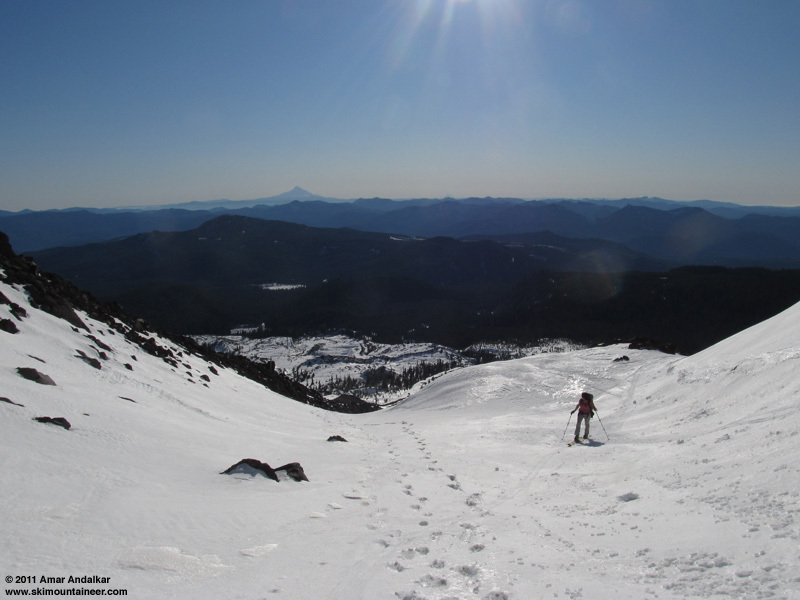 With the ongoing unusually strong ridge of high pressure dominating the Northwest weather for the first week of December, sunny south-facing slopes are becoming the only option for finding good skiing, as even the last remnants of powder on protected north-facing slopes are transforming and vanishing. 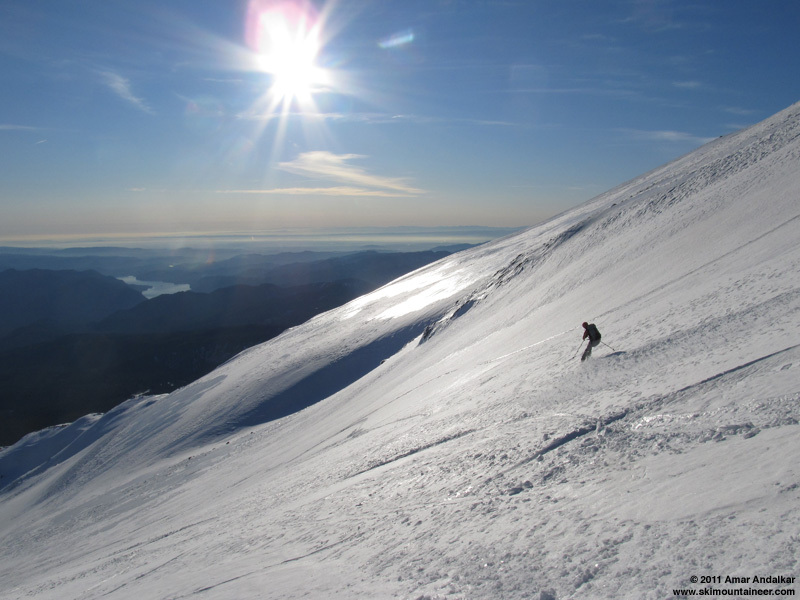 But with the solar elevation barely exceeding 20� above the horizon at noon this time of year, the slopes must be steep enough to catch the sun, and the freezing levels must also rise well above the elevation of the slope to be skied, in order to have any chance of forming corn snow. Based on what we found in the Crystal backcountry on Sunday (see TR), corn was already forming on such south slopes. 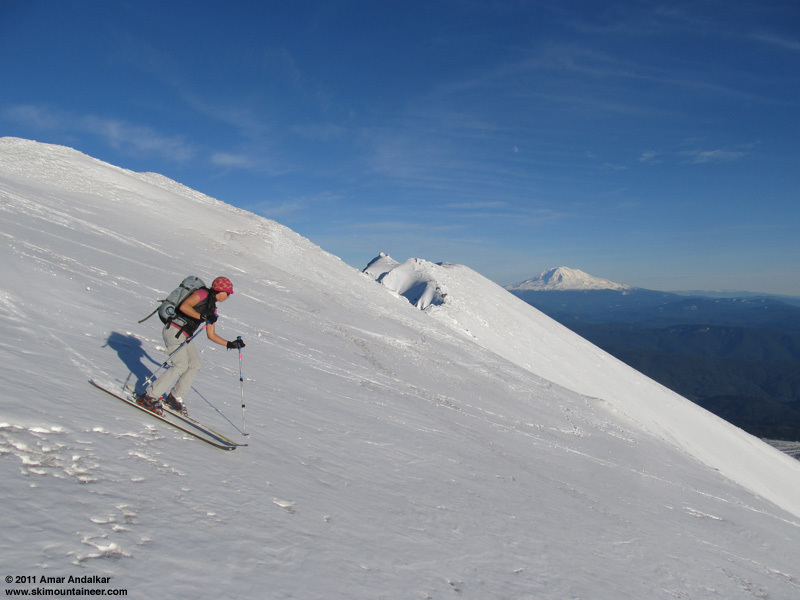 With the expected rise in freezing levels to about 10000 ft on Monday, it seemed like a perfect day to look for corn on Mt St Helens, after a weekend during which the freezing levels never quite rose high enough. We found what we came for and were not disappointed, although the initial view of the mountain from a clearcut along FR 83 showed the route looking a little more bare than we expected. The last 3 miles of FR 83 to Marble Mountain Sno-Park are an unplowed, rutted, frozen-snow-covered mess, as is the parking lot itself with hard-frozen snow about 6" deep. Nice to see that my $41 Sno-Park permit is being used solely to fatten bureaucrats' wallets, and not for any legitimate purpose like actually plowing the Sno-Parks! (which was supposed to start Dec 1 this year). Even sadder than the state of the road and parking lot was seeing the forlorn concrete foundation where the beautiful warming hut once stood, until destroyed by fire in April 2011. The unplowed Sno-Park with the warming hut's foundation at right. 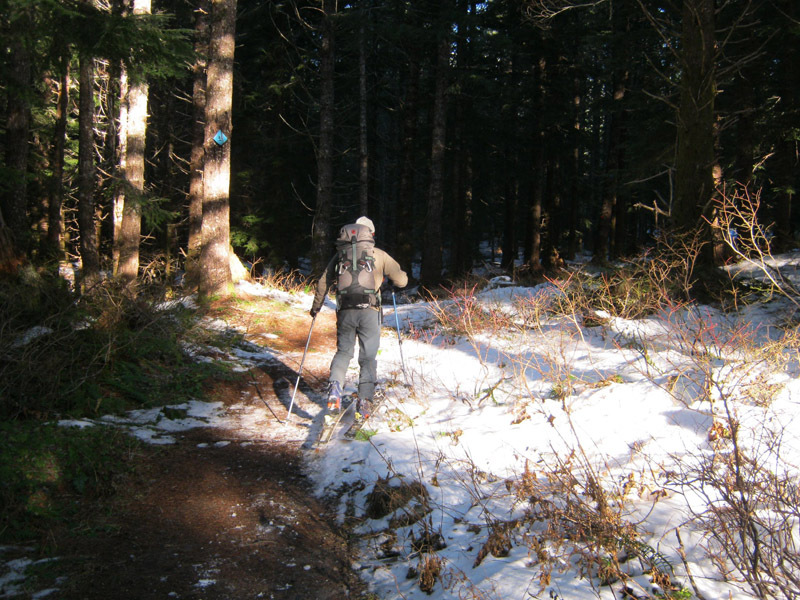 A 5:15am departure from Seattle put us skinning up the trail by 9:30am, with a couple short bare patches near the start which were easily circumvented through the woods, then good coverage steadily deepening the rest of the way to treeline. Firmly frozen snow on the trail gave way to softening snow as we ascended the steepening slopes above treeline, at least on the sunniest SE aspects of the gully system which had gotten morning sun. The softened snow made it easy to skin up the whole way. Unfortunately the sunshine and warm temps turned an hour of the ascent into a slow sweaty slog up a blazing reflector oven from about 5000-6000 ft, feeling more like June than December. Eventually a slight northerly breeze provided relief from the heat. 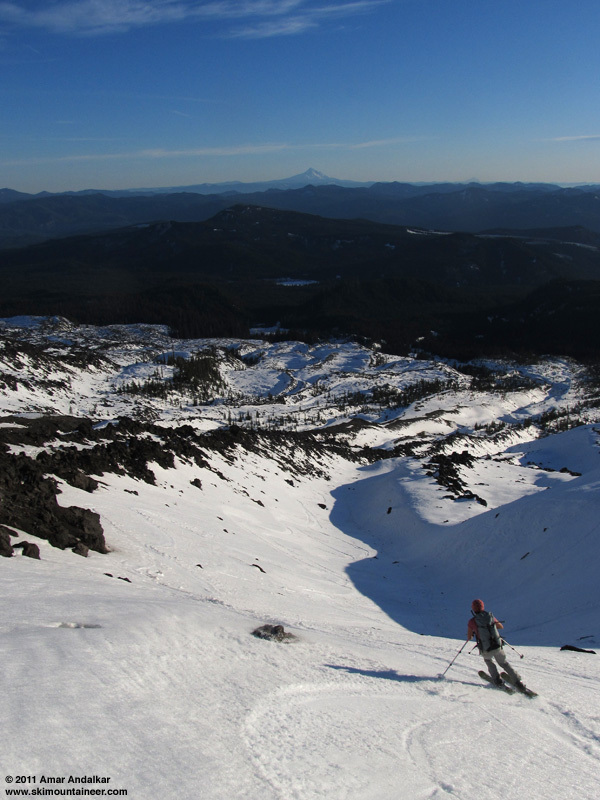 Snow coverage is thinnest in a band from about 4500-6500 ft, with lots of exposed rock in the gullied lava flows, but it was still more than adequate to skin and ski. Firmer snow above 7000 ft had me putting on the ski crampons just in case, but they weren't needed and Hannah skinned up fine without them. 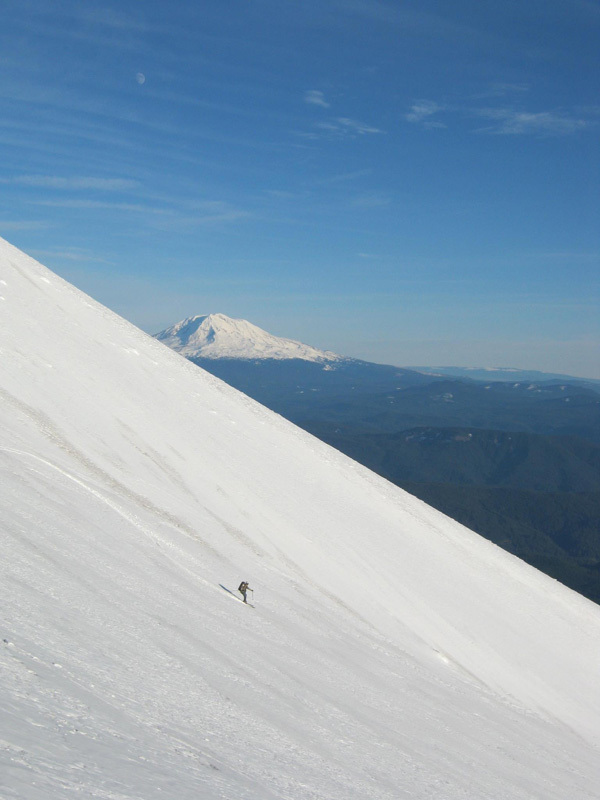 Very empty on the mountain this day, only a single climber on foot and a pair of skiers who skied down around 1:30pm. 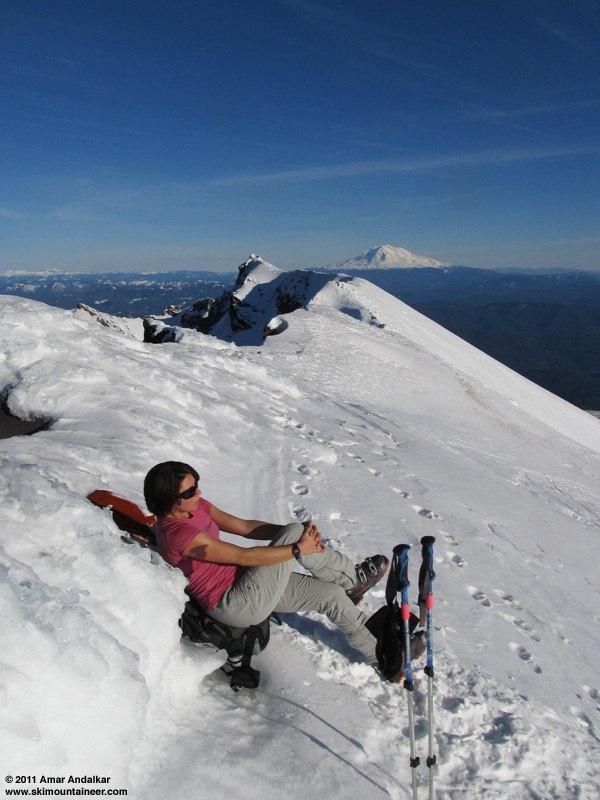 Reached the crater rim just before 2pm, in near-calm conditions and plenty warm enough for relaxing in the sunshine. 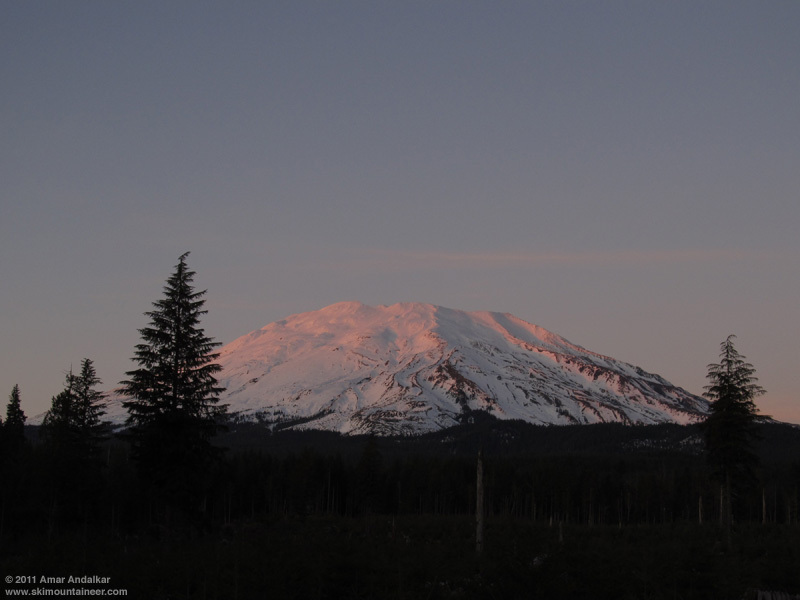 A gibbous moon was rising to the east above Mount Adams. 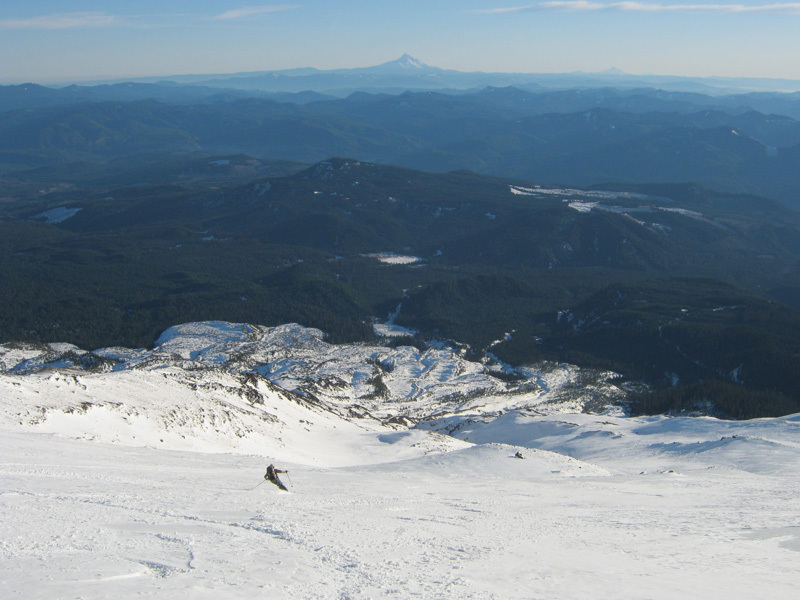 Four-shot panorama from the crater rim, with the lava dome at lower left, and Mounts Rainier and Adams in the distance to the north and east. 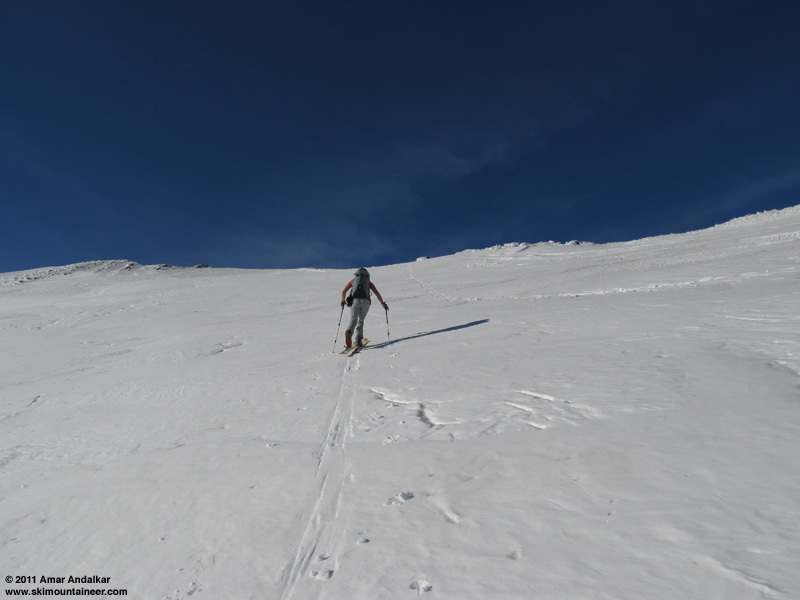 Skied down around 2:45pm after a long rest in the warm sunshine. Mostly smooth firm windpack on the uppermost slopes, with only a few tiny ridges of ice occasionally protruding through. The steepest and sunniest south and SW aspects now held the best softened snow, with large areas of corn especially below about 7500 ft. Really good skiing on those sections, but hard-frozen snow anywhere it was shaded. When the slope flattened near treeline, the corn disappeared even on sunny south aspects, it's just not steep enough to corn this time of year. A quick cruise across the crusty flats brought us back to the forest trail. It was frozen, but less of an icy luge run than it sometimes is, and coverage was good enough to avoid hitting rocks. 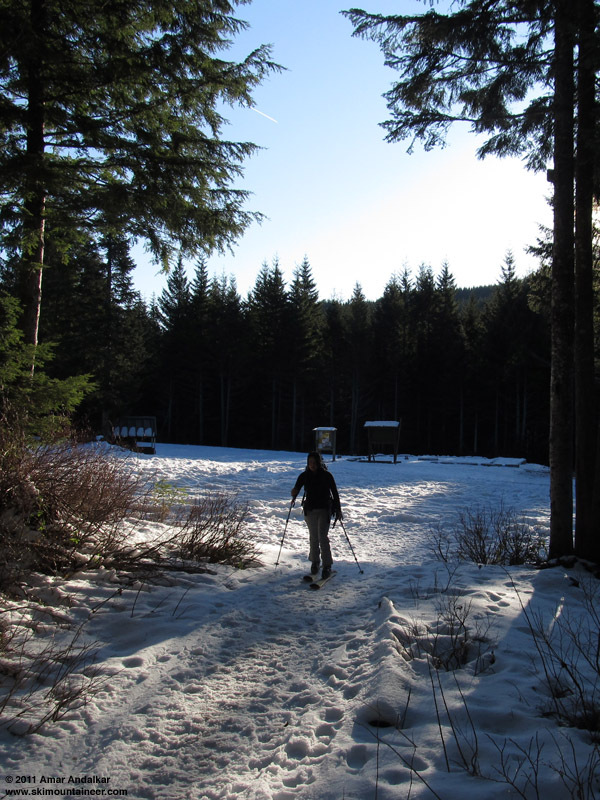 We skied all they back to the car by 4pm with plenty of daylight to spare, including a short detour through the woods in the last 100 yards to keep the skis on where the trail became mostly bare. 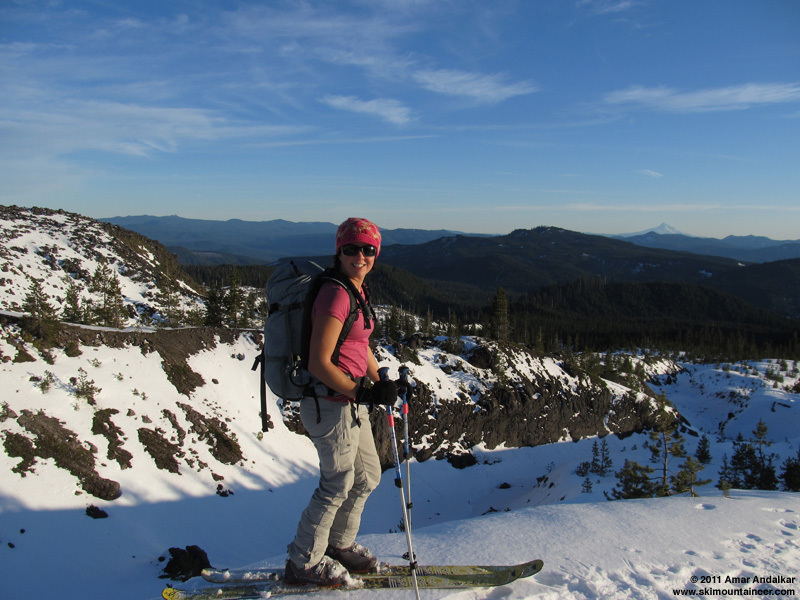 A great day and fun times, totally worth the 195-mile drive from Seattle to ski some December corn in the warm sunshine. I guess that was worth missing nachos. Well dang...that looks pretty good. Guess I shoulda joined. Way to search out the corn. Nice trip! This has me interested in a me-too trip, but the weather's changing a bit this weekend. Unfortunately, from looking at the UW WRF-GFS 4km solar radiation loop, it looks like Sat / Sunday will have some clouds obscuring the sun, which would make for an awful icy time I'm guessing. Tomorrow looks like it's got the solar radiation and temperatures, but I'm wondering if the 10kt wind from the SE will prevent corn from forming. Amar, any tips on predicting December corn? Well, you have the right idea: look for light winds and no clouds with a high freezing level, along with a steep enough southerly aspect (SE, S, or SW depending on time of day), to get corn in December. The 700 mb "Temp, winds, heights" (either at 4km or 12km grid) shows winds near zero (5 knots or less) and a freezing level over 10000 ft in SW WA on Friday at 10am and 1pm, so there should be a high probability of corn on the south side of St Helens. For Saturday, it looks like a very low probability of corn as clouds move in and freezing levels drop, while on Sunday there is near-zero probability. Most likely St Helens will stay frozen and crusty both days. I'm actually somewhat tempted to go back to St Helens on Friday, if I could find a partner(s) to split the cost of driving from Seattle. Gotta ski something Friday since it's the last mostly-sunny day for a while. Crystal Mountain gondola-served groomers were excellent today though. Regarding the UW model: The "Column-integrated cloud water" loop, which basically shows what the cloud cover is expected to be and which I always look at, seems much more useful for self-forecasting than the "Solar radiation" loop, which I almost never look at. Great job finding great conditions so early in the season! 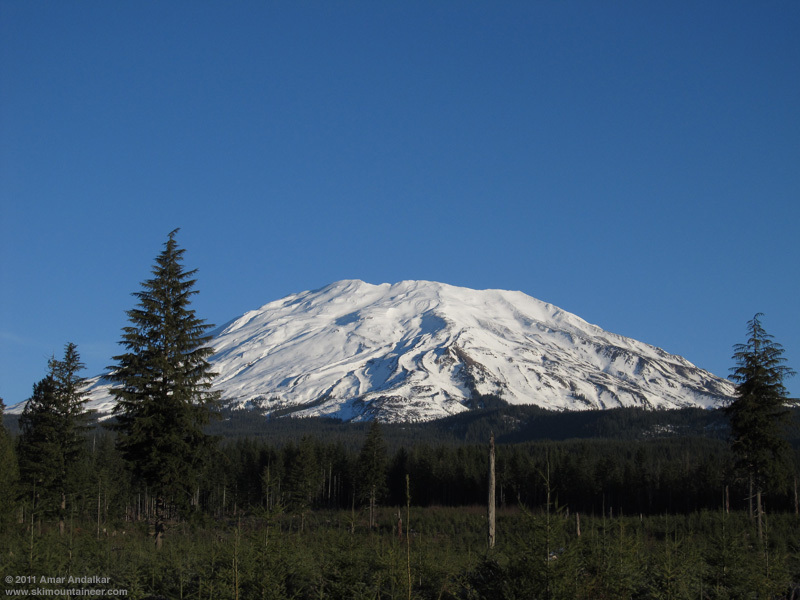 Regarding the snowpark plowing: They won't do anything until the snowmobilers start complaining.� Contract broken between WA and snowpark permit holders.� Kinda justifies scoffing that the requirement doesn't it?